Pomegranates are among the healthiest fruits on Earth. 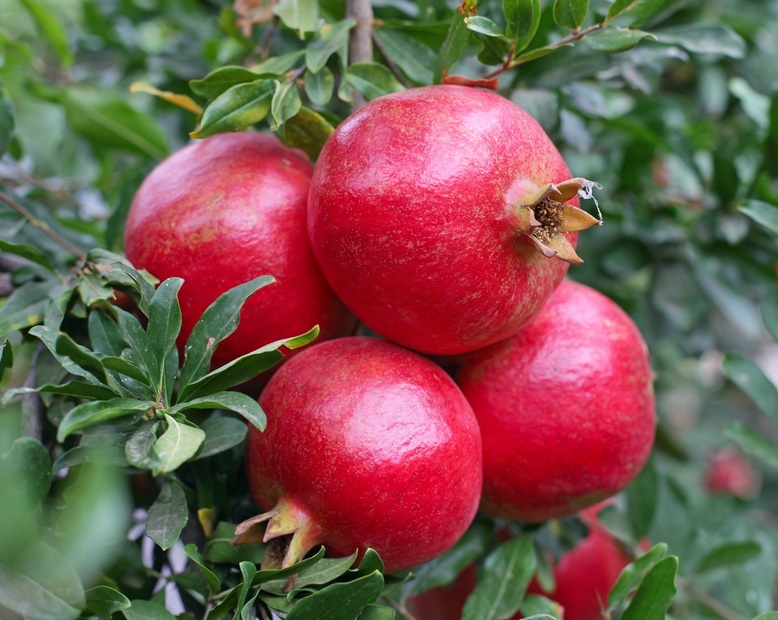 The pomegranate, or Punica granatum, is a shrub that produces a red fruit Categorized as a berry, the pomegranate fruit is about 5–12 cm (2–5 inches) in diameter. It is red, round and looks kind of like a red apple with a flower-shaped stem. India grows different variety of pomegranate and amongs bhagwa is the finest varieties of pomegranate, the fruits have soft seeds with fewer acids. In fact, the fruit quality is much superior to those grown in Spain and Iran in edible quality and attractiveness. Mainly grown in the western parts of Maharashtra and northwestern Karnataka, scores of villages in the districts of Solapur, Nasik, Sangli, Ahmednagar, Pune, and Satara make Maharashtra the country’s pomegranate bowl, with 71.21 % of the total area under pomegranate cultivation in the country. In 2016-17, Maharashtra produced 1.8 million tons of pomegranate, of which 95 % was of the Bhagwa variety which is highly popular exported variety in now in india. 1. Pomegranate carries about 83 calories per 100 grams; slightly more than that of in the apples. It contains no cholesterol or saturated fats. 2. It is a good source of soluble and insoluble dietary fibers; providing about 4 grams per 100 g (about 12% of RDA). Dietary fiber aid in smooth digestion and bowel movements. 3. Nutritionists often recommend pomegranate in the diet to reduce weight and control cholesterol. Regular inclusion of fruits in the diet boosts immunity, improves circulation and offers protection from cancers. 4. The fruit is an also good source of antioxidant vitamin-C, provides about 17% per 100 g of the daily requirement. Consumption of fruits rich in vitamin-C helps the body develop ability to combat infectious agents by boosting immunity. 5. Regular consumption of pomegranate has also been found to be effective against prostate cancer, benign prostatic hyperplasia (BPH), diabetes, and lymphoma. 6. Further, it is an also good source of many vital B-complex groups of vitamins such as pantothenic acid (vitamin B-5), folates, pyridoxine and vitamin-K, and minerals like calcium, copper, potassium, and manganese. India grows six different commercial varieties of the fruit – Ganesh, Mridula, Arakta, Ruby, Phule Bhagwa, and Phule Bhagwa Super. Amongs the Bhagwa variety which is highly popular exported variety now in India. 1. We have Strong connections with farmer ,directly we buy it from farmland. 2. We are flexible to any kind of packaging as our buyer wants. 3. We can provide samples to any part of the world as per you want. 4. If our buyer personally wants to visit us. We can show them every market and their every other POMOGRANATE quality personally.